I've got the moves like Jagger! This song + the beat is totally addictive. Plus, it's Adam Levine! From the most recent post on this blog, you probably have a sense of how I discovered it. Rihanna actually retweeted a link to the blog post regarding her latest music video, Man Down, so of course being both a blog reader and a Rihanna fan, I clicked the link and thoroughly enjoyed what the writer had to say. You might be wondering why she was featured on a book blog. Well, this specific post entitled "Is Rihanna The New Face of Girl Power?" talks about being victimized by male dominance and choosing to turn away from being categorized as a victim and instead, developing into a strong, if not much stronger, and independent woman. She related this with a novel entitled The Botticelli Secret. 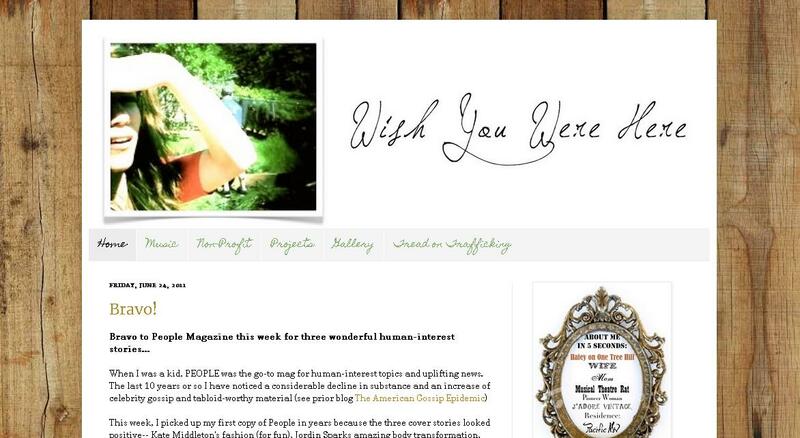 Being a book lover, I thought to myself, "I think I just found my new favorite book blog!" The writer not only posts reviews of books she has read, which is mostly novels centered on women, but also shares her love of food and travel. She is currently working on a chick lit novel according to her Goodreads page. Yes, she's the Bethany Joy Galeotti who plays Haley James-Scott from One Tree Hill. I actually found her blog months ago but I only recently took notice of her posts which are mostly about her personal opinions regarding socio-political matters, sharing her personal causes, and her love for vintage anything. She also sometimes shares beauty tips (like what products she uses to take care of her skin). And of course there are recipes that are bound to pop up now and then since the Galeottis own a family restaurant. 3. Also, there are a couple of Filipino food blogs that I found, Food Trippings and Food Trip Tayo!, which will serve as a guide for me whenever I want to try something new to eat. I spent all day sitting in front on the computer... on a school day. When I woke up this morning I got a text saying we won't have our Cisco 2 class - both lec and lab - leaving PGC to be our only class, which is at 8 PM. Being the lazy person that I am, I decided not to attend that last class anymore because a) it was raining and I didn't want to go out in the rain and b) it was too late already to go to school. It was just one class and besides, it's scheduled as our first period tomorrow anyways. So what the heck did I do for, say, 10 hours straight sitting here with my laptop? Let me list them down for you because I find listing things therapeutic. Watched half of Lady GaGa's Monster Ball Tour. Watched Pretty Little Liars 2x02. Downloaded the new episode of The Voice. Listed some favorite quotes I found stored on my old phone on listography. And just now I was browsing through Terry Richardson's Tumblr. Yeah, that's pretty much it. I did all of that while nursing a slight headache. I planned on finishing Zombicorns by John Green but if I did I knew my headache would be full-blown after reading just a couple sentences from the e-book. I've actually been having headaches literally everyday since last week. Maybe I should really reduce the time I spend on the computer everyday. This song has been out for a while but I've only took notice just now. The thing with me and pop music is that when it gets too much attention, I stay away from it as much as possible until the time the hype dies down. And there's nothing or no one in the music industry right now who gets more attention than Lady GaGa herself. I heard many people were disappointed with the song's music video so I finally decided to watch it and guess what? I actually liked the simplicity of it. The song is already a big production by itself, which I love, so I kind of get wanting to have a subtle video to even it out. I also liked that she and saxophonist Clarence Clemons were the only ones who appeared in the video. I recently heard that Clemons (The E Street Band) died on Saturday upon suffering a stroke about a week ago. Aside from working on this song with GaGa, he also performed on another song from Born This Way, called "Hair." This kind of gives the song a deeper sense of backstory apart from the fact that the song's lyrical inspiration came from the death of GaGa's grandfather, its description being "your last moment on earth, the moment of truth." 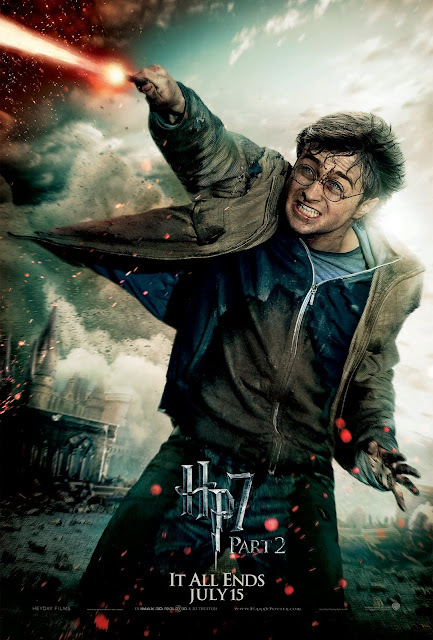 I just finished re-reading the few last chapters of "Deathly Hallows" and right now I feel like I'm ready to take on the final movie. I had all sorts of emotions cross my face while reading. I was so into it at one moment that I was echoing Molly Weasley as she was battling Bellatrix while I was cheering her on. Imagine how I would be when I watch it on the big screen!!! Seeing all these final promotion stuff going around as July 14/15 approaches, I fee like I'm too excited to finally see the last movie that I want time to speed up but at the same time, that feeling of realizing that it's the END makes me want to slow down things a bit. I'm a mess, I know. Just from watching this new trailer, tears flooded my face already. So here it is, the final draw... In a matter of a little over one month, the last and final Harry Potter movie will be shown in theaters and I will cry like a baby as much as I would laugh and cheer and maybe cry some more. I am very proud to have grown up with the golden trio and I am very much thankful to none other (Queen) Jo Rowling for letting us share with her all the magical experiences that she brought to life through her impeccable imagination. Harry Potter will not end this coming July, not really. I believe it will be passed on to generations after generations and our children's children's children and their children will experience the same awe and amusement and fascination as we all experienced when we first turned those pages of the "Sorcerer's Stone" or when we first entered the magical world of Hogwarts through watching the first movie installment. And I know all will be well in the Wizarding World of Harry Potter even after those final credits roll out. I'm not a huge fan of rock but I appreciate it. I listen to Kings of Leon, Paramore, The Fray, and Keane among others. Having three brothers, there's bound to be one who ends up loving rock music. That's my youngest older brother. He listened to Red Hot Chili Peppers, Incubus, and Nirvana among many other '90s rock bands when I was little so I ended up listening to them, too. And of course, there's the Foo Fighters. 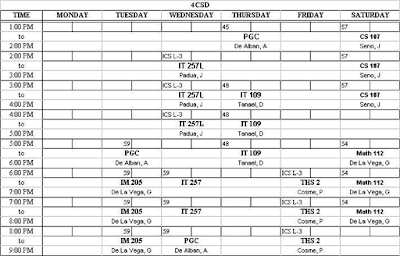 Behold, my schedule for the coming first semester of AY 2011-2012, my last year of college. I didn't want to have to go to school so early because God knows I will just be sleepy during the whole first period but I didn't want to have to leave school so late at night, either. But as with most things in life, I can only choose one of the options. I opted to choose the latter. But lately I seem to be having problems with sleeping in the day, even though I sleep late at night, even past midnight. Probably because I got used to waking up early in the morning to go to work during my month-long OJT. I end up with only 5 or 6 hours of sleep, just like this morning I woke up at 6:50am when I fell asleep at 1 am last night. I tried shutting my eyes again but it didn't work and I wasn't even feeling sleepy anymore. This needs to change, pronto! Also, I'm concerned about how well I am going to perform in class since I'm not used to studying at night. I mean, I used to do homework at night, but I've never had lectures up until 9 pm like what I'll be having this coming sem. But of course I accept the challenge. Good luck to me!! My Saturday schedule makes me miserable, though. My mother even felt bad for me for having to go to school on a Saturday for 7 hours. 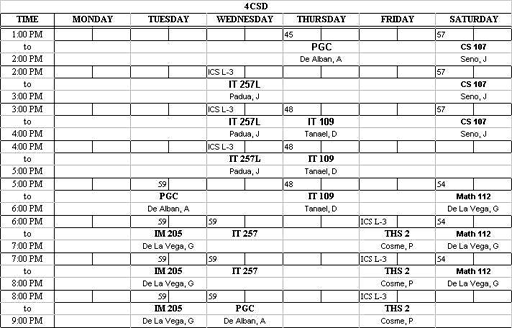 Good thing I have Monday & Friday (the Thesis sched was put there only for formality) off. Anyway, I'm looking forward to a fun sem with my friends, despite the heavy workload it's gonna bring.